The first day of finals for SRC saw 19 crews boat in A Finals for their small boats. Of those 19, 6 came away with medals. The day opened with certified beef cheek Lily Gavan storming home in the WU17 1x to take a Silver Medal. Having only joined the club at the end of last year, she has worked incredibly hard and it’s great to see it pay off with a medal. 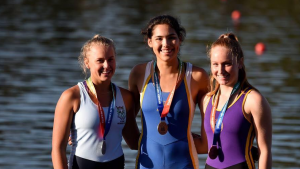 A further congratulations to Sarah Abrams of Hunter Valley Grammar – Lily’s Doubles partner – for taking out Fourth, as well as Lily Eales from Loreto Kirribilli – who will row alongside Lily and Sarah in the WU17 4X+ later in the regatta – On her Gold Medal. Moving up a few age categories, our Under 21 Pairs shone once again. Party Pair of Issy Furrer and Lauren Graham fought through rivals from Banks to take the lead by the halfway point, and continued on to hold clear water over the field for the remainder of the race. In the Men’s equivalent, doing it for Queen and Country, Oscar Olsen and Oscar Carr-Middleton were off to a modest start, sitting in 4th at the 1000m mark. However, known for a sprint finish, our pair of Brits wound to the line to come home with a Silver Medal. 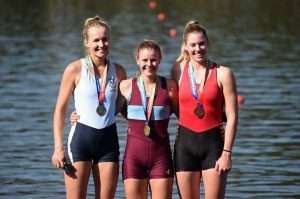 Not long after, Harriet Hudson contested the Women’s Under 23 Single, hoping to better her bronze medal performance of 2018. Harriet quickly settled into second in the first half of the race, and held off doubles partner Georgia Patten to hang on to her Silver Medal across the line. An honourable mention must go to our U23 Pairs of Jackson Kench / Harry Crouch, as well as Alex Potter and Alex Nichol. Their race was one of the closest of the day, with just 1.3 seconds separating 3rd and 6th. Our men were unlucky to be on the wrong side of that battle, with Kench/Crouch placing 6th, and Potter/Nichol 5th. Both crews, however, posted their best times of the season. These men will hopefully be ones to watch over the winter. Finally, our NTC Men put on a great show in the Open Men’s Pair. The all Sydney combination of Josh Hicks and Sam Hardy were hot on the heels of the race leaders through the middle of the race, however couldn’t match the pace of Spencer Turrin (partnered with Hamish Playfair) in the closing stages. Hicks and Hardy came away with a Bronze, whilst Spencer brought home a Silver Medal. Today’s results have far exceeded our usual Thursday standing, bring on the fours and doubles on Friday! 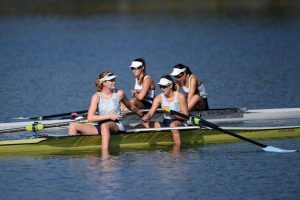 Thankyou to Rowing Australia for the photos.